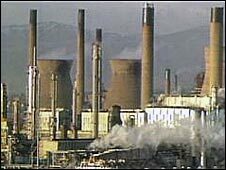 Workers at one of the UK's biggest oil refineries based in Grangemouth are taking part in two days of strike action. The Ineos refinery is the main supplier of fuel to Scotland, processing 210,000 barrels of oil a day. It also supplies the north of England. What does the Grangemouth oil refinery actually do? The Ineos refinery, which sits on the Firth of Forth, is the only refinery north of the border and is Scotland's main fuel supplier. The plant powers the Forties pipeline which is connected to the oil fields in the North Sea and has an annual capacity of about 10 million tonnes of crude oil. Crude is also imported to the site from around the world via its deep sea terminal on the west coast of Scotland. The oil is processed into petrol, diesel, plastic and other materials at various temperatures across a number of different plants in the Grangemouth facility. The site is spread over 1,700 acres of land - or about 640 football pitches - and houses a number of separate businesses run by Ineos, which acquired the business from BP in 2005. The dispute centres on a disagreement between staff and management over the company's pension scheme. Ineos has said its contribution to employees' pensions is "unsustainable" if it is to remain a competitive long-term business. The company is proposing to retain a final salary scheme for all existing members, paying 1/60th salary for every year worked. Bosses have proposed a 6% employee contribution, phased in over the next six years. A different plan will be offered to future new employees. How has the union reacted? The company's workers are protesting at the plans which will close the final pension salary scheme to new entrants and reduce the provision for existing scheme members. The union Unite also said the company was penalising employees for early retirement. In response, 97% of Unite's 1,250 members at Grangemouth voted in favour of strike action on 27 and 28 April. The refinery employs about 1,400 staff in total. The strike is the first at any refinery in the UK for 73 years. Why is a two-day strike at the refinery so disruptive? In order for operations to cease at the plant, while staff are on strike for two days, the system has to be powered down gradually. There is no "off switch". The shutdown process began on Monday 21 April and was completed on Friday. Each plant's equipment has to be cooled and a gradual reduction in pressure maintained. This process takes up to a week to complete. The same is also true when operations are being restarted, although a spokeswoman for Unite said it would take up to three weeks for the plant to be operating at 100% capacity following the strike. A spokeswoman for Ineos said parts of the facility are regularly shut down for maintenance although the walkout by staff signals the first total shutdown of the entire plant. The biggest disruption from the plant's shutdown comes from the closure of the Forties Pipeline System (FPS). The pipeline, which carries a third of the UK's daily oil output, runs from the North Sea to the Kinneil plant, near Grangemouth. This plant is reliant on power and steam from the Ineos facility to function. The pipeline closure means oil from about 65 North Sea platforms has to stop being pumped to Kinneil temporarily. Will there be a shortage of fuel on the forecourt? The Retail Motor Industry Federation, which represent fuel retailers, said there was at least 70 days stock of fuel which would comfortably meet the demand of motorists, providing they did not start to panic buy. Alex Wells of the organisation said: "Fuel comes into the UK from other areas so it does not mean there will be no fuel in the country. "If retailers are not getting fuel from Grangemouth they will source it from elsewhere. "The Ineos plant only really supplies Scotland so to suggest that Newcastle or Yorkshire would be affected is ridiculous." Scotland's Finance Minister John Swinney also said there were enough supplies of petrol and diesel to last well into May if purchasing remained at its normal level. When the strike began on Sunday, tankers carrying fuel from Europe have began arriving in Scotland to ease pressure on the forecourts. Both sides in the dispute are coming under increasing pressure from the UK and Scottish Governments to find a resolution to the pensions row. Despite their differences, both parties have said safety at the plant was a priority and that it would not be compromised during the dispute.